A little Red Zinger Noel-stalgia. I think the Versus coverage of this week's US Pro Cycling classic from Colorado has been fantastic. With the exception of a little picture breakup, the vistas of the Rockies are magnificent. What a fantastic place to ride. Makes this old dog nostalgic for the Red Zinger - the original Colorado stage race back in 1975-1979, which became the Coors Classic from 1980-1988. That Miss and Out stage was won by a crafty young Belgian rider named Noel DeJonckheere riding for the Turin-Chicago team. De Pedaalridders: New cycling reality TV from Flanders. The plot: Two teams of regular wielertourist riders from two clubs (Forza Picasso and WTC Dazalgon) get some special training and preparation from coaches Johan Museeuw and Ludo Dierckxsens before taking on a challenge that looks a heckuva lot like this year's l'Etape du Tour to Alpe D'Huez. It's a show that could only be made in Flanders. More evidence why it's the cycling capital of the planet..
Should be fun stuff. Looks like they'll post episodes on their site... so check it out. Ludo vs. Johan.. who's squad do you think will win? Photo of the day: B&B - Jolly Ceramica's two Giro champions. From 1975-1977, the Italian Jolly Cermaica squadra had two climbing stars. The guy on the left is Giovanni Battaglin, who did not have his best years in that squad, but would go on to win both the Giro and Vuelta in 1981. The man from Marostica near Bassano and Vincenza used a triple chain-ring on his Campy-equipped Pinarello to twiddle up the Tre Cime Lavaredo behind Beat Breu to take the Maglia Rosa that most of Italy assumed would be won by either Moser or Saronni. You can visit Battaglin's bicycle factory store there in Marostica today, see those race winning jerseys on the wall, pick up a jersey, and check out his beautiful race machines, and maybe even get to meet the boss. The man on the right is Fausto Bertoglio, who'd won the Giro in 1975, the year it finished at the summit of the Stelvio. Last Saturday afternoon, Dr. Brad was my partner in crime on a 3-hour spin out and around Scituate Reservoir...the operative word being 'spin', for after my debacle of a TT last week, I decided to call time on big gears and power intervals, and was determined to get back to basics... some good ol' fast pedalling, particularly on the hills. Old school. 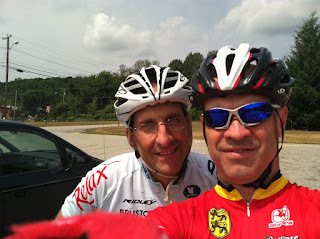 The reservoir ride is one of the best loops we have around here in Rhode Island. It's up and down, but not very hard climbing-wise. But throw in Chopmist and Rocky Hill, and it's a pretty good training route. My focus stayed on turning the legs. Fast. Snuck away from the computer for a similar three and a half hour training spin Tuesday afternoon. Rain was starting to fall in the last hour or so, but that never bothered me, in fact it was nearly perfect. 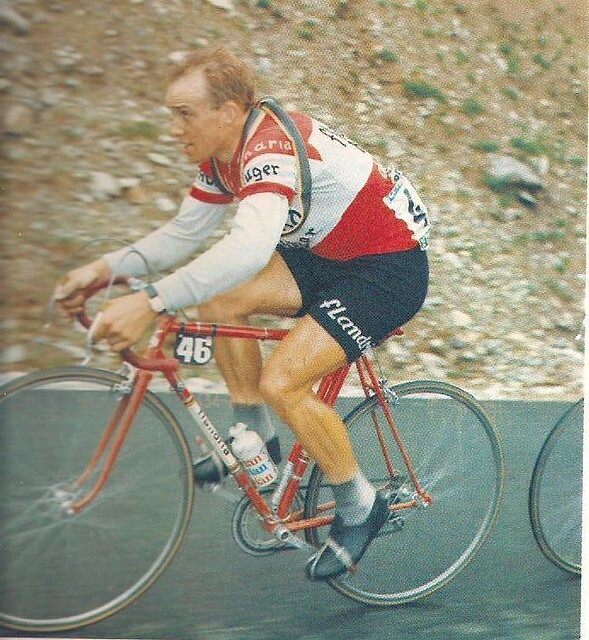 He scored three Ronde van Vlaanderen victories in the time of Merckx, DeVlaeminck and assorted other Flemish supermen. 1970, '72, '73. 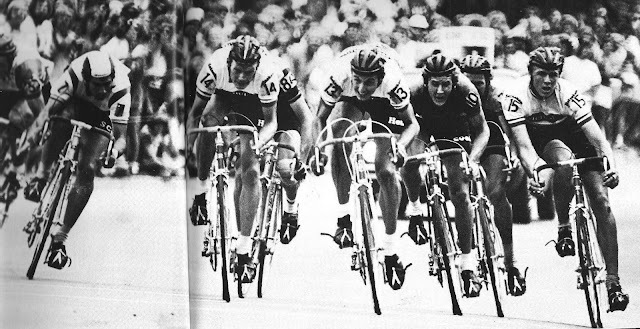 Outsprinting the likes of Freddy Maertens, Walter Godefroot, Frans Verbeeck, Andre Dierickx and even Eddy Merckx himself. A west-vlaanderen, and Flandria, legend. A guy who'd work in his family butcher shop in the off season. Can't picture Tom Boonen doing that, can you? Not many tend to remember him now. Well, they should. My favorite photo of Eric Leman is not one of him sprinting to win the Ronde on his home turf, or on the podium with flowers in his hands. Rather, I love this photo of him fighting...off the back in the mountains.. on a day, and on a parcours that was not his home turf. A photo I can relate to. Probably you can too.